Via Defense for Children International – Palestine (DCIP). Edited for the IMEMC by chris @ imemc.org. 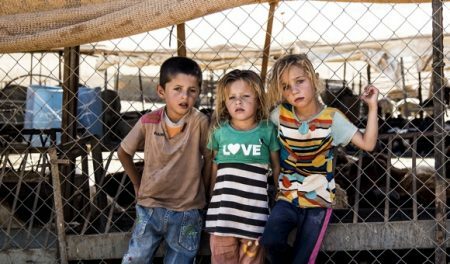 Ramallah, February 6, 2017 — Evictions, demolitions, and UXO (unexploded ordnance) are constant risks for Palestinian children living in areas of the Jordan Valley that Israel has declared as “firing zones,” where Israeli battalions regularly assemble to hone their combat skills. Before tanks can shoot off missile rounds and soldiers can carry out practice missions, goats are removed, animal pens and tents dismantled. When DCIP visited Abu Kbash in late September of 2016, he had recently received a temporary eviction notice. On September 16, the Israeli civil administration ordered all the families in the vicinity, including 51 children, out of their homes between 7 a.m. and 11 a.m. on September 22, 29, and 30. Since 1967, Israel has pursued a discriminatory policy of demolishing Palestinian homes and essential structures, including water systems, livestock pens, solar panels, and even tents and shelters provided by international aid organizations throughout the occupied West Bank, including East Jerusalem. In 2016, Israel’s demolition rates were the highest ever recorded since OCHA began tracking the issue in 2009. Altogether, Israel demolished, dismantled, or othrwise confiscated 1,089 Palestinian-owned structures in the West Bank, including East Jerusalem, displacing 1,593 people. OCHA’s Demolitions Database shows that 15 of these incidents took place in Area C of the Jordan Valley, impacting 98 structures and 124 children.